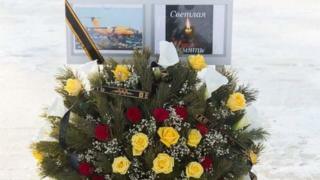 Russia plane crash: Who were the victims? Two women who have lost their mother in the plane crash near Moscow are worried their little sister may be taken in to care. Yekaterina, 20 and Anastasia, 19, have a five-year-old sister, Viktoria. Their mum, Natalya Meshcheryakova, 38, was one of 71 people who died on Sunday when an Antonov An-148 jet crashed. Being trainee teachers, Yekaterina and Anastasia now have no regular income. They live in Orsk, a city in Russia's Ural mountains hit hard by the crash - most of the passengers were from there. The tragedy of Ms Meshcheryakova and her three daughters is described on the Orsk city website, which appeals for donors to help the family. Quoted by Russia's NTV news, Yekaterina said: "I'll get working immediately and get guardianship of my little sister, otherwise they could take her away. "Mum was providing for all of us." There were many young victims aboard the plane. The official list of names (in Russian) shows that all but two were resident in Russia, the two exceptions being a man from Switzerland and another from Azerbaijan. The Swiss man was named as an oil engineer called Ulrich Klaeui, working for Burckhardt Compression. A Russian ice hockey team called Admiral is in mourning for Darya Tolmasova, 22, who was the girlfriend of an Admiral defender, Sergei Ilyin. Tributes have been posted on Instagram. Classmates at a school in Orsk have laid flowers next to a photo of Ilya Poletayev, 17. He had ambitions to study law in Moscow, but was one of the youngest air crash victims. Vladimir Normantovich, 60, was a petrochemical engineer returning to Orsk with his 37-year-old son Alexander. Both were workers at an oil refinery called Orsknefteorgsintez. Ilya Stavskiy, also from the Urals, died on his 33rd birthday. The victims included Antonina Kuzupitsa, 56, head of the Orsk city finance department. A famous local businessman was also on board - Viktor Anokhin, owner of the city's central market. He died alongside his wife Zoya.